Isolating one arm at a time is a fantastic rotation drill. Swimmers call this “right arm only” or “left arm only.” It can be done with any stroke but for our purposes we are going to focus on backstroke today. Notice how relaxed Katie’s fingers are. She’s also set herself up for a pinky first entry after exiting the water with her thumb in the lead. You can see how nice her rotation is because even her shoulder is held out of the water. Even her hips are close to the surface. Her head is inline with her spine. If she wanted to, she could touch her shoulder to her chin. Her opposite arm is glued to her side the entire duration of the drill. Glue one arm to your side and don’t move it at any point of the drill. Swim with the opposite arm only. Keep your head still the entire time. Your body should rotate around your head. Focus on your rotation, making sure your shoulder breaks the surface of the water during the recovery. Make sure your shoulders and hips rotate together. Work on incorporating a 6 beat kick. When the arm you are swimming with is underwater, the arm that you have glued to your side should break the surface of the water. Enter the water pinky first, exit the water thumb first. Once your arm has passed twelve o’clock, the transition to pinky first should be complete. Try to work both arms evenly. Whether you isolate them by distance or stroke count. Whatever you do on the right arm, also do it with the left arm. Pay attention to how one side feels compared to the other. Is one side stronger? Is it easier to maintain body balance or a 6 beat kick on one side than the other? Are you able to have your shoulders clear the water on both sides? Keep your head inline with your spine. Your body must rotate around your head while your head stays still. Your head should be positioned similarly to how it is positioned on land when you’re standing straight. You don’t want to be lifting your head out of the water or leaning your head back in the water. 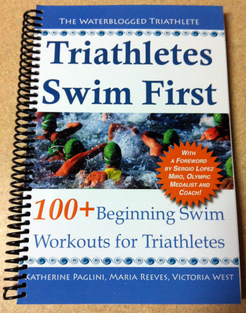 At a minimum, triathletes should be able to swim backstroke and freestyle.